With Valentine's Day rapidly approaching I thought I would try my hand at making "GF/DF (Food Coloring Free) Red Velvet Cupcakes". As you may recall from my Chocolate Dipped Heart Cookies I made last Valentine's Day I colored them naturally with "beet juice" and have once again used beets, in the form of beet puree, to give these delicious and moist cupcakes their rich red color. Wrap beet(s) in aluminum foil and roast in oven for about an hour, until they are very soft. Allow to cool, then remove peel and puree in a food processor or blender. Measure out about 3/4 cup of puree. Reduce oven to 350 degrees and prepare a standard muffin pan with liners. Whisk all dry ingredients in a small bowl. Combine coconut oil, honey, eggs, vanilla, lemon juice, and beet puree in a separate bowl. Divide batter evenly in muffin pan. To make the frosting, whip the palm shortening, vanilla and maple syrup together until completely blended. These look good enough to eat right now. I will have to make some. I love the ingredients, although I do not know palm shortening. Is that a healthy fat? Can you taste the beets at all? I'm not a fan of beets. Hi Kristen; Good question! 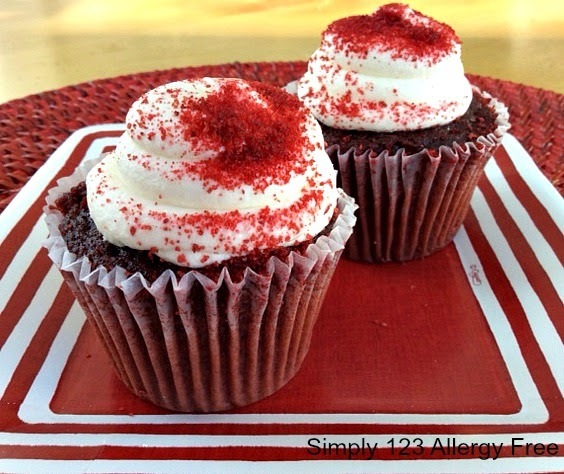 There is a slight taste of the beets in the cupcakes but they do not shout beet flavor, similar to when you use applesauce or black bean in baking. Hope that helps! Thanks for stopping by! These look delicious! I made a red velvet cake one time that was supposed to be red from the beets, but it ended up being brown from putting too much chocolate in. Ha! Hey, a fellow blogger and I have started a link party just for GF, and natural recipe, Would you be interested in linking up? (here's the link: http://frugalfarmwife.com/article/waste-not-want-not-wednesday-featuring-side-dishes/) Thanks! Wow this look fabulous and sinfully delicious. . Makes me want to try to make some of these tasty cupcakes ASAP. Thanks for sharing on Real Food Fridays. Pinned & Twitted. These would be fun for the kid's birthday! Thanks for linking up!